Memorial Sloan-Kettering Cancer Center is the world’s largest private, non-profit cancer center. The institution is dedicated to patient care, education, and research. Memorial Hospital is a referral center for patients from the greater New York vicinity, the United States, and the world. 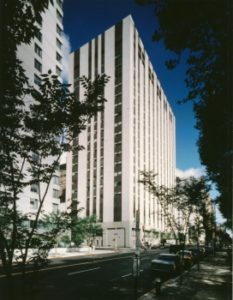 Established in 1884, the present 20-story, 480-bed hospital opened in 1973 and admits more than 21,000 patients annually. The Department of Surgery alone has 209 committed beds and annually averages more than 11,000 patient admissions, 100,000 outpatient visits, 26,000 new patient visits and more than 16,000 surgical cases in its 27 operating rooms. The Department of Surgery at Memorial Sloan-Kettering Cancer Center offers a two-year surgical oncology fellowship to fully trained general surgeons who desire further experience in surgical oncology. Six to eight new fellows are appointed each year. The main goal of the program is to train fellows to become expert surgeons with a thorough understanding of the multidisciplinary care of the cancer patient. The first year of the fellowship consists of a “core” rotation schedule providing experience on the Breast Service (1-2 months), Colorectal Service (1-2 months), Gastric and Mixed Tumor Service (3-4 months), Hepatobiliary Service (1-2 months), Head and Neck Service (1-2 months), Thoracic Service (1-2 months), Gynecologic Service (1 month) and electives (1-2 months). During the two-year program, the fellows will also rotate through pathology (1 month), radiation oncology (1 month), medical oncology (1 month) and may take elective rotations in GI endoscopy (1-3 months). The clinical rotations in the second year of the fellowship are largely based on the interests and goals of each fellow. Up to six months of full-time research can be performed. For interested individuals, there is an option to extend the fellowship to a third year that is completely devoted to research. Numerous research opportunities are available. The Human Oncology and Pathogenesis Program (HOPP) is a new institutional initiative comprised of laboratories dedicated to translational research. Basic science is the focus of laboratories within the Sloan-Kettering Institute. There is a broad range of scientific investigation within the Department of Surgery laboratories. Formal training in clinical research may also be pursued. There are several weekly conferences in the Department of Surgery, including Grand Rounds, General Surgical Oncology Conference, and a didactic lecture series of topics related to surgical oncology. There is a weekly core course in surgical oncology given each summer. Each surgery service has at least one weekly conference as well. Fellows actively teach residents on rounds and in a weekly fellow-run conference. Fellows have access to all conferences within the Center. Currently, there are approximately 50 formal conferences and 5-10 cancer-related lectures each week. After the completion of the fellowship program, most of the graduates (approximately 85% over the past decade) have obtained a full-time appointment in academic surgery. Trainee salary, subsidized housing and health insurance are provided. Interviews are conducted during the month of September. Applications for the following academic year must be received by August 7. For applications, download the SSO Application from this Website.